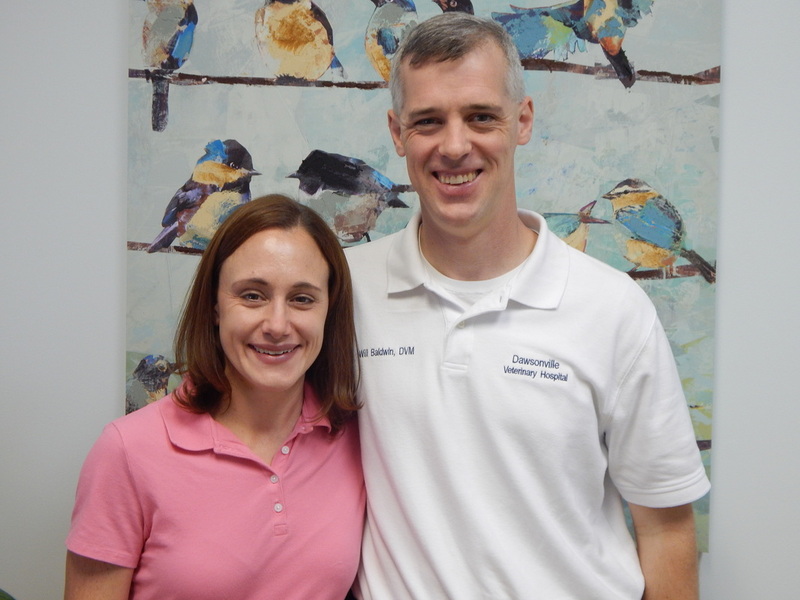 ﻿Will and Emily Baldwin are 2004 graduates of the University of Georgia School of Veterinary Medicine. Will has been practicing both large and small animal medicine in North Georgia since graduation while Emily completed a one year internship in critical care small animal medicine in Charlotte, NC before relocating to North Georgia. They are excited to join the Dawsonville community with their three daughters and numerous pets (3 cats, 1 dog, 1 bird and 4 fish at last count). LeAnne has been working at Dawsonville Vet for nineteen years. She has been a registered veterinary technician since 2004. LeAnne and her husband, Frank, spend most of their free time cheering for the Georgia Bulldogs and the Atlanta Falcons, taking trips to explore the food culture of north Georgia, and checking in on their children- Katie and Emily. LeAnne also has a sizeable contingent of animal family members. She has two collies, Triumph and Bentley, a Cavalier King Charles named Oakley, and seven cats- Lilly, Cinder, Willow, Haley, Chester, Gracie, and Twinkle Toes. Richard has been working at Dawsonville Vet for sixteen years. He has been the kennel manager for the last five years. Richard enjoys hunting, fishing, and playing video games- his new favorite is Batman: Arkham Origins. He is also a huge Georgia Bulldog fan. Sandra has been working as a receptionist and office manager at Dawsonville Vet for twenty five years. Sandra is definitely a people person and loves her job because it allows her to constantly be talking and interacting with the community. Sandra has a gorgeous five year old akita named Anastasia that she loves dearly. In her free time, Sandra enjoys yoga, writing, reading, working out, and watching football and golf. She has traveled to Europe, the Caribbean, and the western United States and enjoys getting out and hiking during her travels. Maggie has been working as a receptionist at Dawsonville Vet for two years. Maggie loves all of her furry friends that come to see her at the check-in desk. She has two dogs of her own- an English setter named Casper and a cocker spaniel named Velcro. Maggie wanted to be a vet growing up, but decided to pursue her other love by completing a masters degree in Art Education. Oriana has been grooming at Dawsonville Vet for three years after working in various animal care professions for over fifteen years. She loves dogs and loves grooming them. She also has five dogs of her own (and three cats, too!). In her free time, Oriana loves watching old movies. When the weather is nice, you can often find her out on the streams casting a line for trout. Alyssa has been working as a veterinary and kennel assistant at Dawsonville Vet for the last two years after working at other practices in the past. In her spare time she enjoys trail riding on her Arab horse Charis and hiking with her dogs Ezio and Tonto. She is engaged to Anthony and will be married in the fall. At home, she likes cooking, listening to music, and reading YA dystopian novels while being harassed by her cats Kai, Chirp, and Felix.